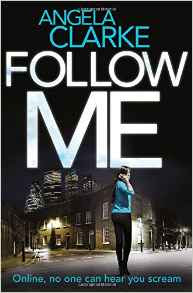 Follow me follows the murder investigation of the serial killer known as the Hashtag Murderer. Why is he known as this, well that is simple. He has taken to twitter, posting cryptic clues and photo's of the murder. The only people this Hashtag killer known on twitter as @Apollyon follows is the victims he's killed or about to kill. The book follows police detective Nasreen Cudmore and Investigative Journalist Freddy Venton who is helping on the case as a social media adviser. Can the team put all the clues together before another body shows up or are they just putting themselves in danger? Nasreen and Freddy have a childhood past together with secrets of their own that they don't want coming out. Can the pair work together professionally or will all there secrets come spilling out? I must admit, my wife brought me this book last year and its sat on my bookcase ever since. Big mistake. I could not put this book down once i started it and i am thrilled to learn it is the first book in a series. The Social Media Murder Series. This book kept me wanting to keep turning the pages in fact it kept me up all night, i didn't sleep till i finished it, it really was that good and that captivating. The characters keep you hooked, you find yourself really rooting for Freddy when she has the answers and the rest of the team wont listen to her and you find yourself screaming for Nasreen to get a grip and stick up for her old friend because she obviously believes the same as her. I found Moast to be rather annoying at times and too tough on Freddy but at the same time you can understand that having done his job for as long as he has you would develop a thick skin. When the killer is revealed i was totally shocked i am usually very good at guessing who the killer is but this time i must say Clarke had me fooled all the way. I have defiantly given this book a 5* review on goodreads and i will be getting the second book on my kindle right now as i can't wait to find out what happens next.